Good morning everyone. 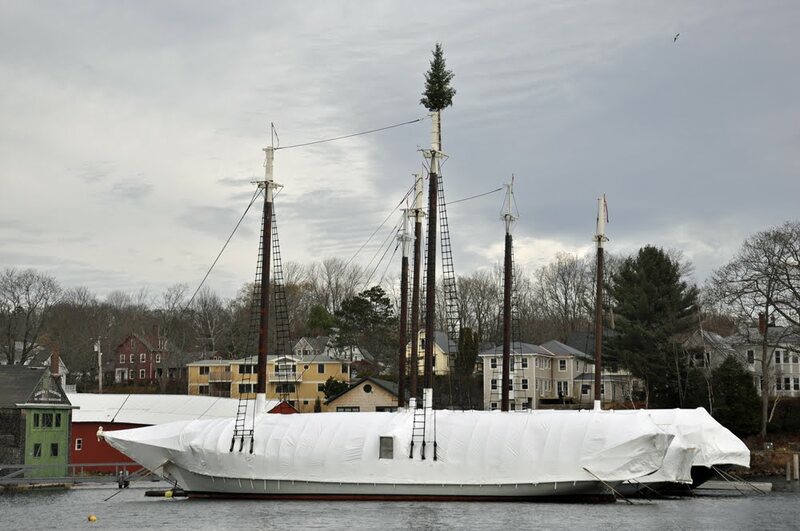 Jen, Katie, and I decided we needed a new topmast for the holidays. What was to be a leisurely day became a mad dash when the harbormaster called with the news that the docks at the head of the harbor would be removed at noon time yesterday. Yikes! OK, so the complexion of the day changed dramatically. The holiday season was off in a rush. 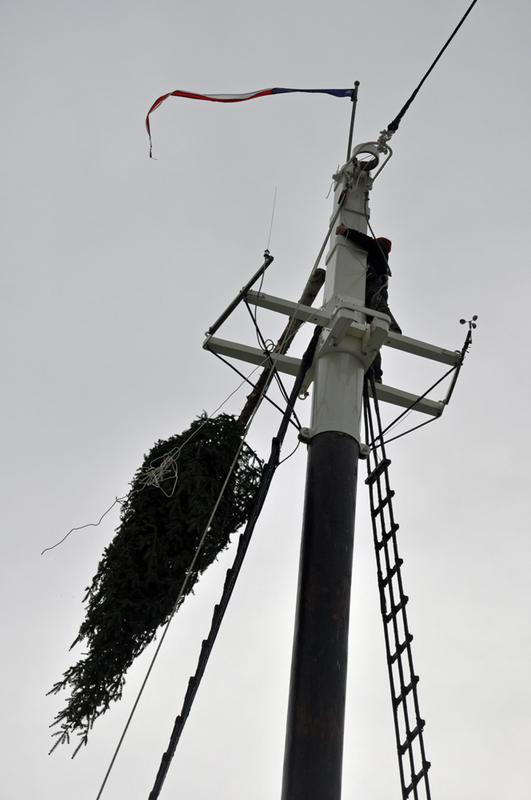 I am not saying we couldn’t have brought the new topmast to the boat without the docks but it sure did make it a heck of a lot easier. 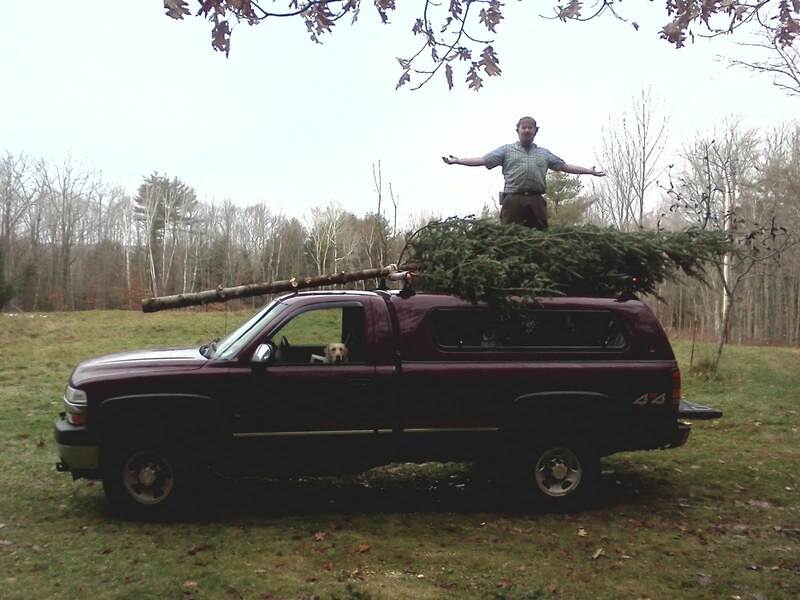 So with a little chainsaw work the tree was down, limbed to the appropriate dimensions and onto the truck in a half hour. That was the easy part. Decorating an 18′ tall Christmas tree is a little more of a challenge. We decided putting the lights together on the ground would be wisest. Next step, aloft we go. Katie sent the winter pig stick down and rigged a gantline. Thankfully Bruce stopped by and with a bit of additional Swedish steam from the harbormaster and Capt Wells of the Lewis R French the tree was sent aloft to the cross trees where Katie and I were waiting. 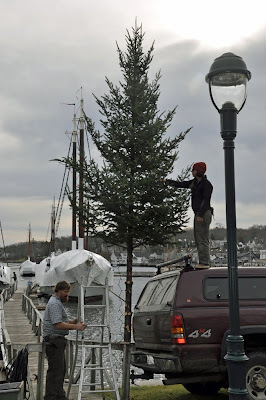 Why I didn’t rig the tree like a yard being sent aloft I will never know. No one ever called me smart. But with patience and perseverance the mission was a success. Thankfully it was a warm day and the wind was only blowing 15kts from the west. Go outside next time you have a 15 kt breeze and watching the evergreens sway. 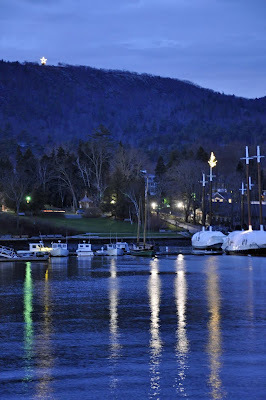 I am sure the noon time quarterbacks eating lunch at the town landing must have a had a great show. I will be picking fir needles out of my hair for a few more days. Posted in camden windjammer cruises sailing vacations and tagged camden windjammer cruises sailing vacations on November 29, 2011 by Captains Barry and Jen. Love this! What is sight it must be in the harbor at night, a beacon unto all this holdiay season.